When Helen Cloud Austin applied for a job at the San Antonio State Hospital, she was told the state had a policy of not hiring black professionals. The year was 1962. Austin, who had a master's degree in social work, was no stranger to racism. But she had learned how to cope with it through her work with Martin Luther King Jr. in Louisville, Ky. So she found a position with a private organization and bided her time. Three years later, with patience and the advocacy of Henry B. Gonzalez, among others, Austin became the first black professional hired by the institution. It went smoothly from there, she said. "Once I was hired at the state hospital, I never had a moment of trouble," Austin said. "You sit down and talk with people, look them in the eye. I was humble, but I knew who I was." Austin went on to do groundbreaking work with the hospital's mentally ill residents, educating their families and helping integrate them into their communities. Now 85, Austin is the subject of two papers written by students in history professor Rhonda Gonzales' senior seminar, and one of a handful of little known but significant local African American women. She's joined by Hattie Briscoe, the first African American to graduate (1956) with a law degree from St. Mary's University. There's Bert Etta Davis, a saxophonist and leader of the Prairie View Co-Ed Band. And Gertrude Baker, Vietnam war veteran, nurse, lesbian activist, actress and supporter of the Esperanza Peace & Justice Center. These women broke racial and gender boundaries, helping to forge a new society in San Antonio and beyond. And most people have never heard of them. When Gonzales designed her senior history course on African American women in the fall of 2009, she was being practical. Her goal was to give students something local to research that fulfilled the hands-on requirements of a Signature Experience. UTSA's San Antonio Black History Collection, spanning 1873–1996, provided the opportunity for the students to dig into primary source material. The results were so full of heart—and new information—that the original course blossomed into a three-semester history project Gonzales hopes to publish as a student-written book on women in San Antonio. "I really think we're on to something, trying to recover women's history in San Antonio, using the resources that we have," Gonzales said. The resulting papers inspired Gonzales to offer a similar course encompassing both African American and Hispanic women in San Antonio this fall. She plans to follow that up with a still broader course on San Antonio women in the spring of 2011. Primary sources give the students a first-hand look at the evidence of a life, instead of letting them view it through the prism of other historians. In the case of San Antonio's African American women, other historians are few and far between. "All these people have done really important work in the community, and nobody really knows about it," Gonzales said. History major Kalia Price got a sense of that when she chose Gertrude Baker. Baker was a complex individual who was drawn to the Esperanza Center's inclusive nature after settling in San Antonio in the late 1970s. "There were very few places she could go that wasn't compartmentalizing some part of her life," Price said. "That's kind of what pulled her and the Esperanza Center together." Baker's lasting impact on the community impressed Price. "The more I read about her, the more I was thinking, 'Man, I want to be like her.' 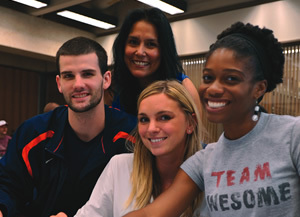 "
In Gonzales' class, students are encouraged to choose a subject they're passionate about. That made it easy for Julie Lopez, who chose Hattie Elam Briscoe, St. Mary's first African American law graduate. Lopez, headed to law school at St. Mary's, devoured whatever she could find on the "courtroom fireball." Briscoe fought the racism and sexism that pervaded the Bexar County Courthouse in the last half of the century, sometimes with colorful statements and sometimes just by biding her time. Lopez developed an enormous respect for her subject. "I thought it would be a grand gesture to do my paper on her," she said. The papers are more than biographies. Gonzales requires her students to place their subjects within their historical context, and examine and explain their impact on history. That impact made an impression on Joaquin Villarreal, who chose Bert Etta Davis, a San Antonio saxophonist who broke gender barriers during World War II with the Prairie View Co-Ed Band. While the all-girl band was considered a novelty at the time, Davis went on to form her own jazz groups and at one point played with blues and jazz great Dinah Washington. As Villarreal sifted through the evidence of Davis' life, he found the normal inconsistencies and careless memories. But one theme was consistent: "She was an excellent saxophone player." She also soldiered on in the work that she loved despite facing dispiriting racism. 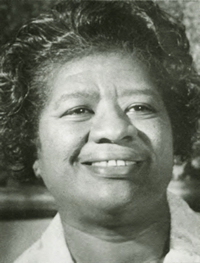 After studying her, Villarreal came to believe that Davis was an unintentional, yet significant, contributor to the civil rights movement. But when she returned to San Antonio around 1970 to care for her elderly parents, nobody knew who she was. Digging up the small, sometimes bitter details of a life can be daunting, but Gonzales guided her charges through it, Villarreal said. "I never felt like I was alone in the process," he said. That includes his introduction to the UTSA Archives and Special Collections at the Institute of Texan Cultures. "ITC was a great resource," he said. At one point Gonzales took them all over to meet manuscripts curator Nikki Thomas, who helped them dive into the university's Black History Collection. "Most of the students have never done archival research," Thomas said. They can't just browse, but must check out a box filled with documents that may or may not yield what they seek. Students quickly find that it's both drudgery and delight, she said, learning to "be prepared to be surprised at what you find, but also be prepared to be disappointed." Gonzales helped the students set up time frames and make sense of the tangle of information they found. "Ask yourself," she said, "what story is begging to be told from this box?" History professor Rhonda Gonzales (upper left) and her students are studying women pioneers in San Antonio. Gertrude Baker was a Vietnam veteran and early lesbian activist. 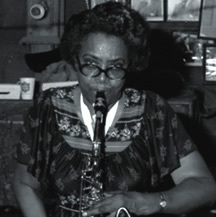 Bert Etta Davis was a pioneering jazz musician. 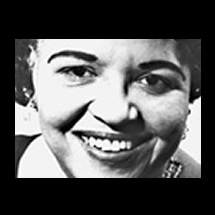 Hattie Briscoe, was the first African American to graduate (1956) with a law degree from St. Mary’s University. 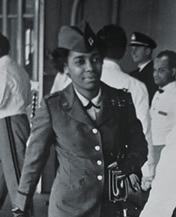 Helen Cloud Austin, was the first black professional hired by the San Antonio State Hospital.